Remember where theater begins? With hangers! And from what your site begins? That's right, with the front garden! Over the years, relevant to this small area in front of the house has undergone a change. 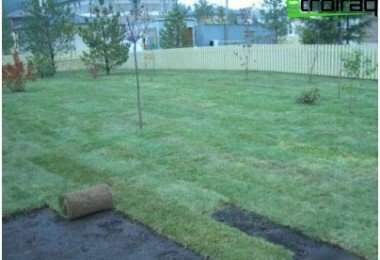 Previously, he was treated as the place where you can plant flowers and put the bench. Today it has become a kind of calling card of a garden plot. It can be seen the result of work the house owner and his aesthetic perception of the world. The best part is that to create a garden with his own hands is quite simple. Thanks to the special tools and a variety of information on the Internet, you can make this piece of terrain completely unique. Typical projects in this matter, as a rule, lacking. And this is good! After all, every gardener has the opportunity to show their skill and imagination. Open. The space, which is in front of the house, in this case, has no fence. It is open for public viewing as with the construction of the porch, and a public road. A typical embodiment of the front garden - a carefully manicured lawn, on which there are beds. He crosses the path leading to the main entrance. Frames territory extremely low fence, which does not interfere with viewing. Closed. In this case, it is fenced off from the street by a hedge. Some owners prefer to fence - brick, wrought iron, wicker, wood, stone, etc. An example of this type can be considered the front garden courtyard, which is surrounded by high hedges. It does not allow to penetrate from the outside no noise, no dust. Russian type. All that is behind the windows of the house should be, above all, to please the host eye. Kind of the way they care less than the view from the windows of the mansion. Most likely, it will be a closed area, enclosed on all sides by a fence (perhaps not always deaf) thick green or flowering hedge. Much attention is paid to the inner decoration of the front garden. It may be clay figures, painted wooden decor and a large number of richly blooming flowerbeds. European type. There are applied stringent standards. 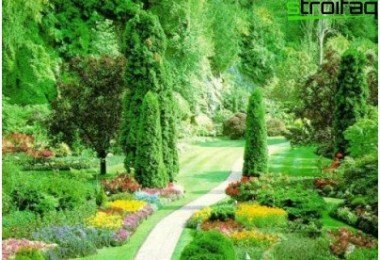 They are reflected in the verified geometry lines carefully manicured lawns, shrubs and trees, as well as perfect design paths and flower beds. In most cases, open type, allowing any passerby to get not only fun, but also to evaluate the quality and level of garden design. On this patio is thoroughly planned, including the form of steps and arrangement of pots with exotic plants. 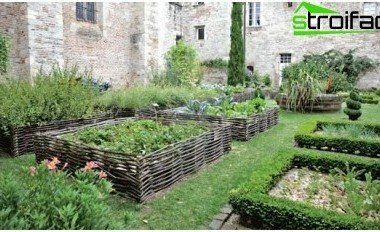 It is possible to plan the design of your garden, leaning on one of the styles - romantic, rustic, Japanese, Mediterranean, German, etc. On some of them we dwell. This simple, concise and landscaping for those who prefer a noisy group of privacy and solitude. Done German garden picket,which performs a decorative function. Alternatively, he may have no barriers, allowing you to see all the plants that are in front of the house. They are selected depending on the preferences and the nature and kind of holders activity. If you like neatly trimmed bushes and flowers of medium size quiet tones, then most likely you are a business person and enthusiastic work. Creative nature choose bright flowering plants such as shrubs and lush pink wild rose. Every resident in Germany is not a house without a front yard or even vases, facing its entrance. If you are a person who is inclined to asceticism andphilosophy, you'll like this style. 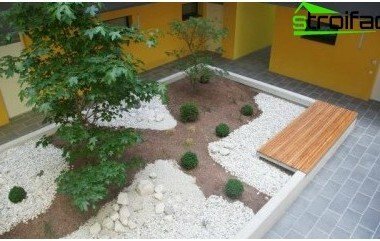 Landscaping of the site is so varied, that is able to express the mood, taste and even the social status of the owner. Japanese-style clarity and observedlaconic forms. It is mandatory to be present stones and a small pond. 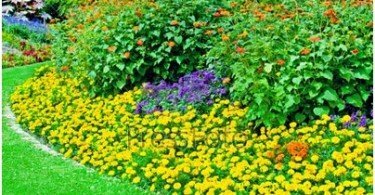 Preference is given to perennial herbaceous plants, which form the basis of the landscape project. Among the flowers dominant position given to iris, hellebore, Astilbe and daylilies. Basic care is associated with preservation of early forms of greenery. 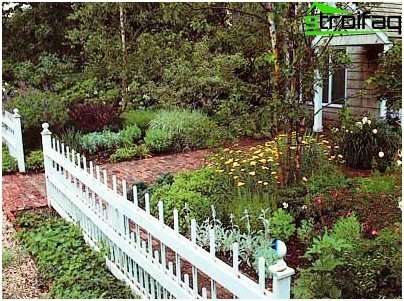 The most important thing in a classic style - a selectfence for the front yard or other enclosure, which helps to withstand a single style. Fans of violent flowering and an abundance of colors can opt for a country style. It is characterized by simplicity of the device and further care. 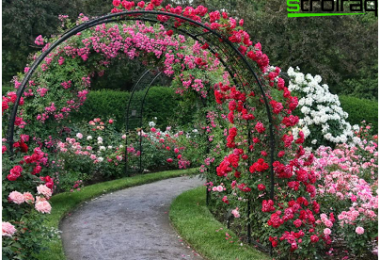 This garden is usually shielded by wicker fence or picket fence. It looks great many familiarplants. We are talking about bells, peonies, Phlox paniculata, dahlia, helenium, nasturtium. 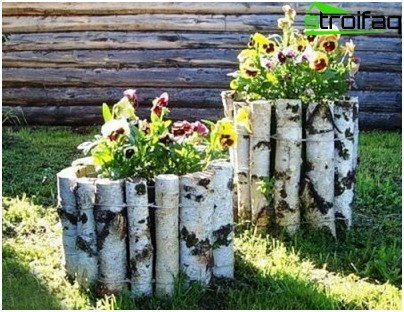 In the corner of the plot can be planted birch funeral, but so that its branches could not hide too much land area. You can install on a bench near the treebirch chumps and landed near some bushes chubushnika. Earth's crust near her fall asleep. Hollow birch stumps are often used as special beds under the bells. On both sides of the path, laid out towards the garden, you can plant asters and phlox. A feature of the classical frontage is considered to be its deliberate negligence. 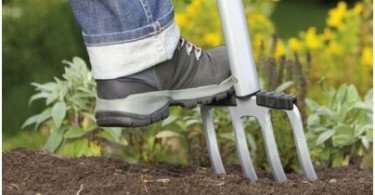 Caring for them is very simple - periodically enough to weed and water the plants. The fence is made of birch twigs. It hung Krynki and chopped iron pots. If you put the part kalistegiyu street, such a fence will look very impressive. As you know, for the front garden unitWe need a combined approach. You can use different methods of design and materials, as well as take into account the nuances of the different styles. 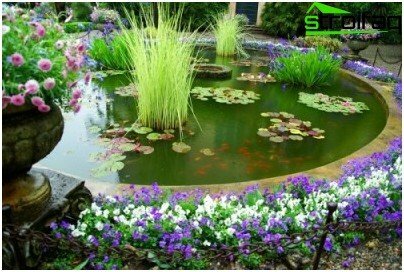 The main thing is to land in front of your home in harmony with it and look more attractive as possible! We wish you success!